All 2018 Flag Officer assignments for the U.S. Navy. Flag Officers in the Navy or Coast Guard carry ranks of Admiral, vice admiral, or rear admiral (above the rank of Captain) and have a pay grade of O-7 and above. Rear Adm. Peter A. Garvin will be assigned as commander, Patrol and Reconnaissance Group, Norfolk, Virginia. Garvin is currently serving as commander, Navy Recruiting Command, Millington, Tennessee. Capt. Brendan R. McLane, selected for promotion to rear admiral (lower half), will be assigned as commander, Navy Recruiting Command, Millington, Tennessee. McLane is currently serving as chief of staff, Naval Surface Force, U.S. Pacific Fleet, San Diego, California. Capt. Lance G. Scott, selected for promotion to rear admiral (lower half), will be assigned as chief, Global Operations Center, U.S. Transportation Command, Scott Air Force Base, Illinois. Scott is currently serving as executive assistant, U.S. Pacific Command, Camp H. M. Smith, Hawaii. Capt. John D. Spencer, selected for promotion to rear admiral (lower half), will be assigned as director, Nuclear Support Directorate, Defense Threat Reduction Agency, Ft. Belvoir, Virginia. Spencer is currently serving as executive assistant, U.S. Strategic Command, Offutt Air Force Base, Nebraska. Rear Adm. Richard A. Correll will be assigned as director, plans and policy, J5, U.S. Strategic Command, Offutt Air Force Base, Nebraska. Correll is currently serving as commander, Submarine Group Seven; commander, Task Force Seven Four; and commander, Task Force Fifty Four, Yokosuka, Japan. Capt. Jeffrey S. Scheidt, selected for promotion to rear admiral (lower half), will be assigned as commander, Naval Information Warfighting Development Center, Norfolk, Virginia. Scheidt is currently serving as executive assistant, Deputy Chief of Naval Operations for Information Warfare, N2N6, Office of the Chief of Naval Operations, Washington, District of Columbia. Rear Adm. John T. Palmer will be assigned as commander, Defense Logistics Agency – Land and Maritime, Columbus, Ohio. Palmer is currently serving as director, logistics, fleet supply and ordnance, N4, U.S. Pacific Fleet, Pearl Harbor, Hawaii. Rear Adm. (lower half) John W. Korka, selected for promotion to rear admiral, will be assigned as commander, Naval Facilities Engineering Command; and chief of Civil Engineers, with additional duty as commander for facilities and environment, Navy Installations Command; and deputy commander for facilities and environment, Marine Corps Installations Command, Washington, District of Columbia. Korka is currently serving as commander, Naval Facilities Engineering Command, Pacific; and director, Fleet Civil Engineer, U.S. Pacific Fleet, Pearl Harbor, Hawaii. Rear Adm. (lower half) David G. Manero will be assigned as senior defense official, Defense Attaché, United Kingdom, U.S. European Command, London, England. Manero most recently served as defense attaché, Moscow, Russia. Capt. John J. Adametz, selected for promotion to rear admiral (lower half), will be assigned as commander, Naval Facilities Engineering Command, Pacific; and director, Fleet Civil Engineer, U.S. Pacific Fleet, Pearl Harbor, Hawaii. Adametz is currently serving as commanding officer, Naval Facilities Expeditionary Warfare Center, Port Hueneme, California. Capt. James A. Aiken Jr., selected for promotion to rear admiral (lower half), will be assigned as deputy director for resources and acquisition, J8, Joint Staff, Washington, District of Columbia. Aiken is currently serving as executive assistant and naval aide, Office of the Assistant Secretary of the Navy for Financial Management and Comptroller, Washington, District of Columbia. Capt. Thomas J. Anderson, selected for promotion to rear admiral (lower half), will be assigned as commander, Naval Surface Warfare Center, Washington, District of Columbia. Anderson is currently serving as executive assistant, Naval Sea Systems Command, Washington, District of Columbia. Capt. Heidi K. Berg, selected for promotion to rear admiral (lower half), will be assigned as director, J2, U.S. Africa Command, Stuttgart, Germany. Berg is currently serving as special assistant to the director of Digital Warfare Office, Washington, District of Columbia. Capt. William E. Chase III, selected for promotion to rear admiral (lower half), will be assigned as deputy director, command, control, communications, and computers/cyber (DD C4/Cyber), J6, Joint Staff, Washington, District of Columbia. Chase is currently serving as chief of staff, Naval Information Forces, Suffolk, Virginia. Capt. Richard J. Cheeseman Jr., selected for promotion to rear admiral (lower half), will be assigned as assistant commander for career management, PERS-4, Navy Personnel Command, Millington, Tennessee. Cheeseman is currently serving as acting assistant commander for career management, PERS-4, Navy Personnel Command, Millington, Tennessee. Capt. Craig A. Clapperton, selected for promotion to rear admiral (lower half), will be assigned as deputy director, future operations, J3F, U.S. Cyber Command, Fort Meade, Maryland. Clapperton is currently serving as director, aviation safety, Naval Air Force, U.S. Pacific Fleet, San Diego, California. Capt. Joseph A. Diguardo Jr., selected for promotion to rear admiral (lower half), will be assigned as deputy director of plans and policy for countering weapons of mass destruction, U.S. Special Operations Command, Tampa, Florida. Diguardo is currently serving as assistant deputy director for global operations; and special assistant to the vice chairman of the Joint Chiefs of Staff for special projects and innovations, Joint Staff, Washington, District of Columbia. Capt. Leonard C. Dollaga, selected for promotion to rear admiral (lower half), will be assigned as commander, Undersea Warfighting Development Center, Groton, Connecticut. Dollaga is currently serving as director, Department of the Navy Appropriations Matters Office, Office of the Assistant Secretary of the Navy for Financial Management and Comptroller, Washington, District of Columbia. Capt. Kristen B. Fabry, selected for promotion to rear admiral (lower half), will be assigned as director, Logistics, Fleet Supply and Ordnance, N4, U.S. Pacific Fleet, Pearl Harbor, Hawaii. Fabry is currently serving as director, Fleet Resources Integration, U.S. Fleet Forces Command, Norfolk, Virginia. Capt. Christopher S. Gray, selected for promotion to rear admiral (lower half), will be assigned as commander, Navy Region Northwest, Silverdale, Washington. Gray is currently serving as chief of staff, Navy Installations Command, Washington, District of Columbia. Capt. John E. Gumbleton, selected for promotion to rear admiral (lower half), will be assigned as deputy chief of staff for strategy, resources, and plans, N5, U.S. Naval Forces Europe/Africa/U.S. Sixth Fleet, Naples, Italy. Gumbleton is currently serving as director, Department of the Navy Operations Division, Office of the Assistant Secretary of the Navy for Financial Management and Comptroller, Washington, District of Columbia. Capt. James A. Kirk, selected for promotion to rear admiral (lower half), will be assigned as deputy commander/chief of staff, Joint Warfare Center, Allied Command Transformation, Stavanger, Norway. Kirk is currently serving as deputy, weapons and sensors, N96, Office of the Chief of Naval Operations, Washington, District of Columbia. Capt. Timothy J. Kott, selected for promotion to rear admiral (lower half), will be assigned as assistant chief of staff, operations, Allied Joint Forces Command, Naples, Italy. Kott is currently serving as branch head, program planning and development, N801, Office of the Chief of Naval Operations, Washington, District of Columbia. Capt. John S. Lemmon, selected for promotion to rear admiral (lower half), will be assigned as commander, Naval Air Warfare Center, Aircraft Division; and assistant commander for research and engineering, Naval Air Systems Command (AIR-4.0), Patuxent River, Maryland. Lemmon is currently serving as vice commander, Naval Air Systems Command, Patuxent River, Maryland. Capt. Fredrick R. Luchtman, selected for promotion to rear admiral (lower half), will be assigned as lead for the physiological episodes (PE) effort, Arlington, Virginia. Luchtman is currently serving as executive assistant, U.S. Pacific Fleet, Pearl Harbor, Hawaii. Capt. Scott W. Pappano, selected for promotion to rear admiral (lower half), will be assigned as director, Comprehensive Test Facility, Philadelphia, Pennsylvania. Pappano is currently serving as compatibility test facility program manager, Naval Surface Warfare Center, Philadelphia Division, Philadelphia, Pennsylvania. Capt. Ryan B. Scholl, selected for promotion to rear admiral (lower half), will be assigned as deputy director, plans, J5, U.S. Strategic Command, Offutt Air Force Base, Nebraska. Scholl is currently serving as chief of staff, Naval Air Force, U.S. Atlantic Fleet, Norfolk, Virginia. Capt. Philip E. Sobeck, selected for promotion to rear admiral (lower half), will be assigned as director, 21st Century Sailor Office, N17, Office of the Chief of Naval Operations, Washington, District of Columbia. Sobeck is currently serving as special assistant, N2/N6, Office of the Chief of Naval Operations, Washington, District of Columbia. Capt. Gregory N. Todd, selected for promotion to rear admiral (lower half), will be assigned as chaplain of the Marine Corps; deputy chief of chaplains; and deputy director of religious ministries, N097B, Office of the Chief of Naval Operations, Washington, District of Columbia. Todd is currently serving as chaplain of the Coast Guard, Headquarters, U.S. Coast Guard, Washington, District of Columbia. Capt. Douglas C. Verissimo, selected for promotion to rear admiral (lower half), will be assigned as deputy director for operations, National Joint Operations Intelligence Center, Operations Team Two, J3, Joint Staff, Washington, District of Columbia. Verissimo is currently serving as commanding officer, USS Carl Vinson (CVN 70), San Diego, California. Capt. Darin K. Via, selected for promotion to rear admiral (lower half), will be assigned as deputy chief, medical operations, M3, Bureau of Medicine and Surgery, Falls Church, Virginia. Via is currently serving as command surgeon, U.S. Central Command, Tampa, Florida. Capt. George M. Wikoff, selected for promotion to rear admiral (lower half), will be assigned as deputy director for operations, National Joint Operations Intelligence Center, Operations Team Five, J3, Joint Staff, Washington, District of Columbia. Wikoff is currently serving as executive assistant to the Chief of Naval Operations, Washington, District of Columbia. Rear Adm. (lower half) Stephen T. Koehler, selected for promotion to rear admiral, will be assigned as director of operations, J3, U.S. Pacific Command, Camp H. M. Smith, Hawaii. Koehler is currently serving as commander, Carrier Strike Group 9, San Diego, California. Rear Admiral (lower half) Michelle C. Skubic, selected for promotion to rear admiral, will be assigned as commander, Naval Supply Systems Command / chief of Supply Corps, Mechanicsburg, Pennsylvania. Skubic is currently serving as commander, Defense Logistics Agency – Land and Maritime, Columbus, Ohio. Rear Admiral (lower half) Edward B. Cashman will be assigned as commander, Standing NATO Maritime Group One, Norfolk, Virginia. Cashman is currently serving as commander, Joint Task Force Guantanamo, U.S. Southern Command, Guantanamo Bay, Cuba. 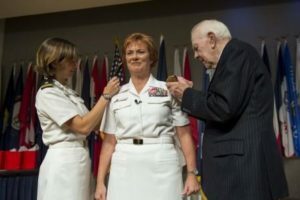 Rear Adm. (lower half) Tina A. Davidson will be assigned as commander, Navy Medical Education, Training, and Logistics Command; deputy chief, Bureau of Medicine and Surgery, Education and Training BUMED (M7); and additional duties as director of the Nurse Corps, Fort Sam Houston, Texas. Davidson is currently serving as director, Medical Resources, Plans, and Policy Division, N0931, Office of the Chief of Naval Operations; and additional duties as director of the Nurse Corps, Washington, District of Columbia. Rear Adm. (lower half) Bruce L. Gillingham will be assigned as director, Medical Resources, Plans, and Policy Division, N0931, Office of the Chief of Naval Operations, Washington, District of Columbia. Gillingham is currently serving as deputy chief, medical operations, M3, Bureau of Medicine and Surgery, Falls Church, Virginia. Rear Adm. (lower half) David A. Welch will be assigned as commander, Naval Surface and Mine Warfighting Development Center, San Diego, California. Welch is currently serving as director for international engagement, N52, Office of the Chief of Naval Operations, Washington, District of Columbia. Rear Adm. Patrick A. Piercey will be assigned as chief of staff, U.S. European Command, Stuttgart, Germany. Piercey is currently serving as director of operations, J3, U.S. Pacific Command, Camp H. M. Smith, Hawaii. Rear Adm. (lower half) Donald D. Gabrielson will be assigned as commander, Carrier Strike Group Eleven, Everett, Washington. Gabrielson is currently serving as commander, Logistics Group, Western Pacific; commander, Task Force 73; and Singapore area coordinator, Singapore. Rear Adm. (lower half) David A. Goggins will be assigned as program executive officer for submarines, Washington, District of Columbia. Goggins is currently serving as director, Ohio replacement, Washington, District of Columbia. Rear Adm. (lower half) Gregory N. Harris will be assigned as chief of naval air training, Corpus Christi, Texas. Harris is currently serving as commander, Carrier Strike Group 11, Everett, Washington. Rear Adm. (lower half) Michael P. Holland will be assigned as director, Programming Division, N80, Office of the Chief of Naval Operations, Washington, District of Columbia. Holland is currently serving as commander, Submarine Group 10, Kings Bay, Georgia. Rear Adm. (lower half) Jeffrey T. Jablon will be assigned as commander, Submarine Group 10, Kings Bay, Georgia. Jablon is currently serving as deputy director, plans, J5, U.S. Strategic Command, Offutt Air Force Base, Nebraska. Rear Adm. (lower half) Carl A. Lahti will be assigned as commandant, Naval District Washington, Washington, District of Columbia. Lahti is currently serving as director, Energy and Environmental Readiness Division, N45, Office of the Chief of Naval Operations, Washington, District of Columbia. Rear Adm. (lower half) Gary A. Mayes will be assigned as director, Energy and Environmental Readiness Division, N45, Office of the Chief of Naval Operations, Washington, District of Columbia. Mayes is currently serving as commander, Navy Region Northwest, Silverdale, Washington. Rear Adm. (lower half) Charles W. Rock will be assigned as commander, Navy Region Mid-Atlantic, Norfolk, Virginia. Rock is currently serving as commandant, Naval District Washington, Washington, District of Columbia. Rear Adm. (lower half) Murray J. Tynch III will be assigned as commander, Logistics Group, Western Pacific; commander, Task Force 73; and Singapore area coordinator, Singapore. Tynch is currently serving as assistant chief of staff, operations, Allied Joint Forces Command, Naples, Italy. Rear Adm. (lower half) Frank D. Whitworth will be assigned as deputy chief, tailored access operations (S32), Signal Intelligence Directorate, National Security Agency, Fort Meade, Maryland. Whitworth is currently serving as director, J2, U.S. Africa Command, Stuttgart, Germany. Rear Adm. (lower half) John V. Fuller will be assigned as director, J5, U.S. Northern Command, Peterson Air Force Base, Colorado. Fuller is currently serving as commander, Carrier Strike Group 1, San Diego, California. Rear Adm. (lower half) Shane G. Gahagan will be assigned as program executive officer for tactical aircraft programs, Patuxent River, Maryland. Gahagan is currently serving as commander, Naval Air Warfare Center, Aircraft Division; and assistant commander for research and engineering, Naval Air Systems Command (AIR-4.0), Patuxent River, Maryland. Rear Adm. (lower half) Kevin M. Jones will be assigned as commander, Defense Logistics Agency Distribution, New Cumberland, Pennsylvania. Jones is currently serving as commander, Office of Special Projects, Washington, District of Columbia. Rear Adm. (lower half) Karl O. Thomas will be assigned as commander, Task Force 70; and commander, Carrier Strike Group 5, Yokosuka, Japan. Thomas is currently serving as director, 21st Century Sailor Office, N17, Office of the Chief of Naval Operations, Arlington, Virginia. Rear Adm. Steven L. Parode will be assigned as director, Warfare Integration Directorate, N2/N6F, Office of the Chief of Naval Operations, Washington, District of Columbia. Parode is currently serving as deputy chief, tailored access operations, S32, National Security Agency, Fort Meade, Maryland. Rear Adm. (lower half) Kelly A. Aeschbach will be assigned as director of intelligence, J2, U.S. Strategic Command, Offutt Air Force Base, Nebraska. Aeschbach is currently serving as deputy director of intelligence, U.S. Forces Afghanistan; and assistant deputy chief of staff for intelligence, North Atlantic Treaty Organization Headquarters Resolute Support, U.S. Central Command, Kabul, Afghanistan. Rear Adm. (lower half) Daniel W. Dwyer will be assigned as commander, Carrier Strike Group 9, San Diego, California. Dwyer is currently serving as chief of staff/deputy chief of staff for strategy, resources, and plans, N5, U.S. Naval Forces Europe/Africa/U.S. Sixth Fleet, Naples, Italy. Rear Adm. (lower half) Alvin Holsey will be assigned as commander, Carrier Strike Group 1, San Diego, California. Holsey is currently serving as deputy director for operations, National Joint Operations Intelligence Center, Operations Team Five, J3, Joint Staff, Washington, District of Columbia. Rear Adm. (lower half) Brian S. Hurley will be assigned as reserve deputy commander for maritime operations, U.S. Fleet Forces Command, Norfolk, Virginia. Hurley most recently served as reserve deputy commander, U.S. Seventh Fleet, Yokosuka, Japan. Rear Adm. (lower half) John F. Meier will be assigned as commander, Carrier Strike Group 10, Norfolk, Virginia. Meier is currently serving as assistant commander for career management, PERS-4, Navy Personnel Command, Millington, Tennessee. Rear Adm. (lower half) Samuel J. Paparo Jr., will be assigned as director, J3, U.S. Central Command, MacDill Air Force Base, Florida. Paparo is currently serving as commander, Carrier Strike Group Ten, Norfolk, Virginia. Rear Adm. (lower half) James E. Pitts will be assigned as commander, Submarine Group 7; commander, Task Force 74; and commander, Task Force 54, Yokosuka, Japan. Pitts is currently serving as commander, Undersea Warfighting Development Center, Groton, Connecticut. Rear Adm. (lower half) John F. Wade will be assigned as commander, Carrier Strike Group 12, Norfolk, Virginia. Wade is currently serving as commander, Naval Surface and Mine Warfighting Development Center, San Diego, California. Rear Adm. Mark L. Leavitt will be assigned as commander, Naval Safety Center, Norfolk, Virginia. Leavitt is currently serving as reserve deputy commander for Maritime Operations, U.S. Fleet Forces Command, Norfolk, Virginia. Rear Adm. Matthew A. Zirkle will be assigned as chief of staff, U.S. Naval Forces Europe/U.S. Naval Forces Africa/U.S. 6th Fleet, Naples, Italy. Zirkle is currently serving as director, Navy Reserve Innovation Branch, N095, Office of the Chief of Naval Operations, Washington, District of Columbia. Rear Adm. (lower half) Brian K. Corey will be assigned as program executive officer for unmanned aviation and strike weapons, Patuxent River, Maryland. Corey is currently serving as commander, Naval Air Warfare Center, Weapons Division; and assistant commander for test and evaluation, Naval Air Systems Command (AIR-5.0), China Lake, California. Rear Adm. (lower half) Marc H. Dalton will be assigned as director, maritime operations (DMOC/N04), U.S. Pacific Fleet, Pearl Harbor, Hawaii. Dalton is currently serving as commander, Task Force 70; and commander, Carrier Strike Group 5, Yokosuka, Japan. Rear Adm.(lower half) William S. Dillon will be assigned as commander, Naval Air Warfare Center, Weapons Division; and assistant commander for test and evaluation, Naval Air Systems Command (AIR-5.0), China Lake, California. Dillon is currently serving as commander, Naval Safety Center, Norfolk, Virginia. Rear Adm. (lower half) John C. Ring will be assigned as commander, Joint Task Force – Guantanamo Bay, U.S. Southern Command, Guantanamo Bay, Cuba. Ring is currently serving as executive assistant, N98, Office of the Chief of Naval Operations, Washington, District of Columbia. Rear Adm. (lower half) Dell D. Bull will be assigned as deputy director, operations and intelligence integration, Joint Improvised – Threat Defeat Agency, Reston, Virginia. Bull most recently served as special assistant for Naval Air Systems Command, Arlington, Virginia. Rear Adm. (lower half) Paul T. Druggan will be assigned as program director, Aegis Ballistic Missile Defense, Missile Defense Agency, Dahlgren, Virginia. Druggan is currently serving as commander, Naval Surface Warfare Center, Washington, District of Columbia. Rear Adm. Daniel H. Fillion will be assigned as director, Manpower Account Transition Office, Washington, District of Columbia. Fillion is currently serving as director, global operations, J-3, U.S. Strategic Command, Offutt Air Force Base, Nebraska. Rear Adm. (lower half) John B. Skillman will be assigned as commander, Expeditionary Strike Group 2, Virginia Beach, Virginia. Skillman is currently serving as deputy commander and chief of staff, Joint Warfare Center, Allied Command Transformation, Stavanger, Norway.